Hello Kitty Record Book. This quality book of firsts, from the Hello Kitty range, is beautifully illustrated throughout and has space to capture all those important milestones such as hospital band, first bath, first word etc. Book title: Chinese Characters. - Language : Simplified Chinese along with pin yin. - Large pictures large words large print for kids age 1 to 4. 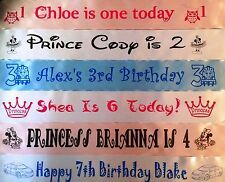 Personalised Products. Our story began with our eldest daughters own wedding. Reception Decor. Evening Bags. Flower Girl Baskets. We believed that planning a wedding should be as enjoyable and stress free as possible and that the word “wedding” should not be used as an excuse to over inflate prices. It was published by John Carle & Sons of NYC. The rest is blank. BEATRIX POTTER'S PETER RABBIT. Dated 1976. Ink-less Print Kit. NO INK and NO MESS! For the Adopted Child. The album is from 1982 and has not been used. This adorable album would be a wonderful place to record. The inside of box is fine, yet outside is not - as shown in last two photos. Gender neutral design. 1 page for each month up until the age of one. 52 pages - A4 size. 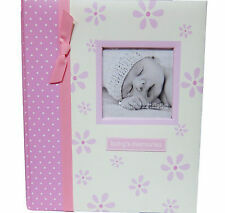 Holds 12, 4" x 6" Photos - Baby safe. - Cover holds one bonus baby pic. Up for your consideration is a beautiful new in box set. You will receive exactly what you see in the image above. 520pcs 5 to20mm 3D Wiggly Eyes Dolls DIY Handcraft Sticky Card Making Wobbly Scrapbooking Adhesive Plastic Toy. A cute handcraft gift for children :D. These beautiful eyes are perfect for kids Toy making / Card making / Scrapbooking and other craft work. Perfect gift for anyone expecting a baby girl or boy. Ne w wi th ou t bo x ( ex ce ll en t co nd it io n - pl ea se r ef er t o al l ph ot os f or c om pl et e de sc ri pt io n of w ha t is i ns id e th e bo ok f or y ou r sp ec ia l li tt le o ne ). 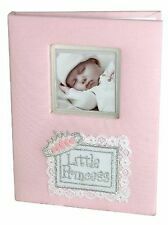 1980's small sized baby photo album by Hallmark. Cute baby image with a little mouse taking the baby's photo. Holds 20 3 1/2" x 3 1/2" photos. Album is in mint condition. Hello, I am Naomi and you are viewing one of my baby month milestone cards. baby mickey mouse design on them. This item has been printed on a Canon MG8250 Photo Printer. So in July 2013 I started Bump & Bunny. Changed your mind on your item?. Not quite the right size for you?. That is fine. We understand that these things happen. Peel the sticker from the backing and place it centered & close to the neckline of the baby's bodysuit or t-shirt. Press down firmly. Your little ones are going to look so cute in their monthly photos! Album is for 3.5" x 3.5" photos. Model P348-37. Sold AS-IS. My Birth Certificate. Baby On The Way. Padded hardcover. Includes pages to record 1st - 12th month milestones. Family Tree. Showered with Love. Love At First Sight. My First Family Vacation. Peel the sticker from the backing and place it centered & close to the neckline of the baby's bodysuit or t-shirt. Press down firmly. Baby monthly stickers 1 to 12 months. Your little ones are going to look so cute in their monthly photos! Pink Chevron clasping photo wallet by CR Gibson. Holds 20 4x6 photos. Great for a gift or to keep yourself! Grandparents love them! Guess How Much I Love You Photo Album Scrap Book Sam McBratney Unused Based on the modern classic childrens book Guess How Much I Love You, this adorable album provides the perfect backdrop for photographs of special people in your life. 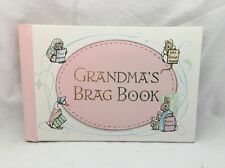 The beautifully crafted hardback album features abridged text and full-color illustrations from the celebrated storybook, plus space for more than fifty of your favorite 3" x 5" or 4" x 6" photographs. Youll also enjoy: - Ease of photo attachment no photo corners needed! - An accordion-fold storage envelope on the inside back cover - And more! High in quality and stunning in design, this elegant photo album will be cherished for generations. Has spiral binding and is refillable. New with no writing. NO HANDLING FEES. No writing on the pages and they are in perfect condition! This is Baby's Memory Book, probably given away as an advertisement of Libby, McNeill & Libby Foods. The size of the book is about 7 1/4" × 5 3/8" with 16 pages.